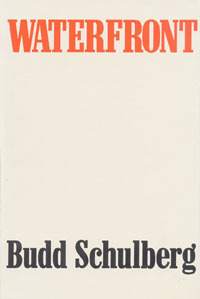 Budd Schulberg has drawn for us the whole turbulent, seething harbor of New York - a world in itself. Here are the traffic turmoil, the sea-smells and sounds, the seething activity and the riverfront slum dwellers of simple faith - long accustomed to violence, betrayal and sudden death. In numerous novels and short stories, Schulberg has proved himself a knowing interpreter of the world of violence - its language, its physical rhythm, and its underlying motivations. But in the intertwined stories of Terry Malloy, the "fringe hoodlum" who struggles against a faint pricking of an unfamiliar conscience, and a slum-reared Catholic priest who struggles with the problem of applying first-century Christianity to twentieth-century corruption, the author has succeeded in writing a novel of indignation in terms of unforgettable characters. Their response to the violent challenge of the waterfront charges the book with universal meanings far beyond the day-to-day anxiety of the port itself. Waterfront brings to life the humanity and inhumanity, the idealism and corruption, the heroism and depravity of a dark corner of our socity.